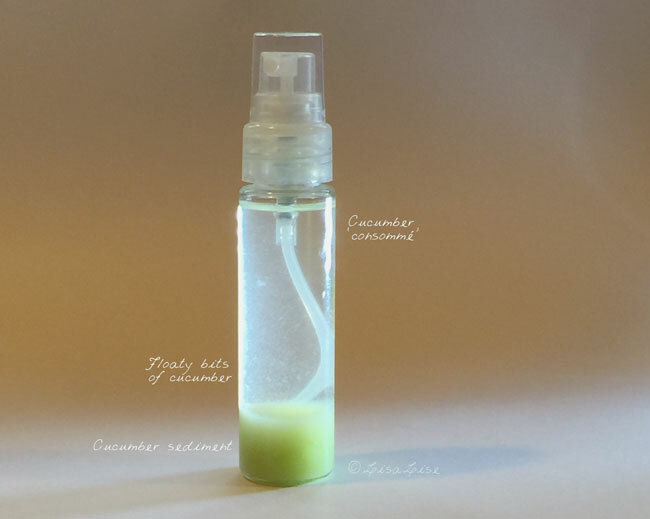 Here are 2 batches of soothing cucumber eye serum. They both contain real-live, freshly-grated organic cucumber juice. 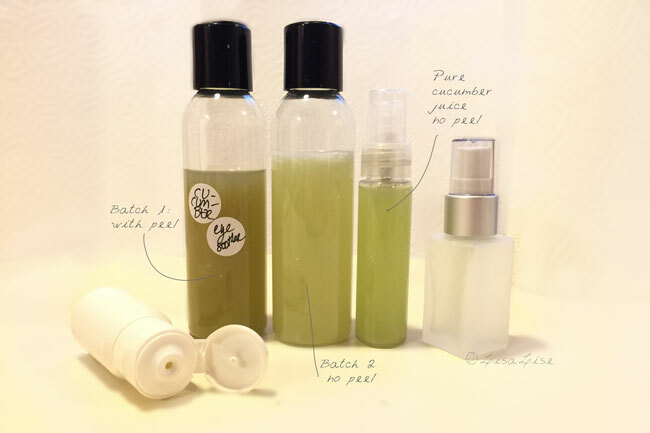 The left-most tall bottle is batch 1 – a serum made with juiced unpeeled cucumber. The middle bottle is serum batch 2 – made with juiced peeled cucumber the day after batch 1 was made. The small spray bottle contains preserved pure juice (no peel). This was partly to monitor how the juice behaved (and to try it out as a refreshing face spritzer). Let's have a look at how these serums and spritzer fared, shall we? The juice-spritzer was given a home on my desk so it could be closely monitored (and used). It didn't take more than 24 hours for this to happen. Even after a gazillion (ok, 6) filterings through layers and layers of finely meshed material, the juice separated. Hundreds of thousands of teensy tiny bits of cucumber had snuck right past all of my carefully constructed filters. After a single day, there were floaty bits, sediment on the bottom and a semi-clear cucumber consommé at the top. But even though the contents of this bottle doesn't exactly look appetizing, the scent still has an acceptable freshness about it (though no longer with that 'crisp edge' a freshly grated cucumber has). A simple shake of the bottle re-dispersed the floaty cucumber bits. In a matter of hours, however, it separated again. I stopped using it after 1 day and let it stand around so I could monitor it. The scent has remained unchanged - acceptably fresh-smelling. Both serums were only slightly better behaved than the juice. It was immediately evident that including the peel was not ideal. Despite scrubbing the cucumber thoroughly before grating it, the scent of this batch was heavier and had a waxy, almost 'dirty' undertone. The color dulled considerably overnight. The scent remained almost unchanged. To my surprise, the heavy-almondy scent of the benzyl alcohol (which usually overpowers everything in a mix) was completely undetectable after a few hours. This batch both looked and smelled more appealing from the get-go. The color didn't dull quite as quickly. The scent of the benzyl alcohol was also completely undetectable after a short time. Both serums were placed in sample containers for use. I stopped using batch 1 after two applications - purely because of the unappealing color and heavier scent. I stopped using batch 2 after about 4 days. Both serums are still being monitored. Here's a peek at what everything looked like after 9 days. Both serums and the juice still smell fresh, but you have to close your eyes to believe it. The color has dulled on all of the products, the mixtures look unappetizingly grungy, and batch 2 gel is now also suffering from 'separation anxiety'. I'll bet you're expecting me to tell you not to formulate with food. You can formulate with food all you like. As a matter of fact, I´m planning on exploring the concept of fresh food in a preserved product a bit more. Mariá left a real interesting comment about placing fresh food in glycerine to create an extract and then using the glycerine in a product. She's done this successfully with both cucumber and strawberries. Now that sounds like something I'd like to try, and if you would be kind enough to share your method Mariá, I would love to give it a whirl and document it right here. The method I use couldn't be simpler: dip your fresh food in glycerine. In order for the extract to be self-preserving, the amount of glycerine should be over 25%. What I do is to calculate (ish) the amount of water the food may have, and then add the same amount of glycerine to have approximately a 50% extract. For example, cucumber. The amount of water in a cucumber is 96%. It's almost all water. So, if we take 100 g of fresh cucumber and cover COMPLETELY in 100 g of glycerine, after 6 weeks (or less, depending on your patience) we would have almost 200 g of a nice fresh cucumber smelling 50% glycerine cucumber extract for our concoctions. I've succeeded with this method to make cucumber, pineapple and strawberry extract. The max dose I would recommend if 10%, and only if this extract is the only additive. If more extracts or actives will be added, I would recommend to reduce it to 6-8%. I forgot to say, regarding dosage, that what I do is to dose it at 5% because I add more things. But I've tested it at 10% as the only additive without any problem. When I formulate just for myself, I tend to keep my formulas quite simple, but if I'm making anything for my friends (I don't have customers, I never sell what I make ;) ) I reduce the amount of this extract in order to add more actives, like urea, MSM, other botanical extracts/tinctures, etc. Hi Maria - Oooh thanks so much for sharing! I will get straight on this!! Hugs coming your way from Copenhagen! Hello I am thinking of making a papaya peel glycerite for the very first time. I'm a bit stumped on how to calculate the water content in papaya. Can you please help with any advice?